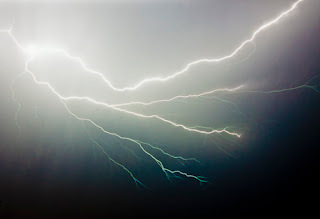 Lightning photography might make you think lightning reflexes right? Well its sort of the opposite, more like infinite patience. 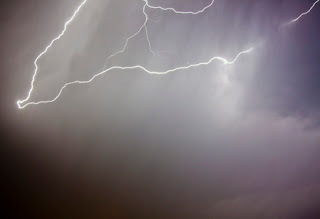 The best thing is, even a good portion of digital point and shoots can be made to capture lightning these days. It was perfect, the rain coming down, storm blowing in from the south which happened to be the only way I could set my shot up. Having the protection of a covered balcony definitely provided the shoot, but at the same time - limited it. You will notice in the three lightning photos, there is no juxtaposition. 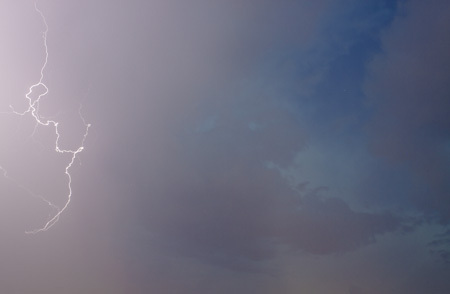 No reference point to give the viewer an idea of the lightning's size. So what are you going to do in your next attempt at lightning photos? Add a compositional element. Maybe silhouette of a treeline, hydro pole, a building lit up, water reflecting your strike, anything to show your lighning in relation to something else. In my own defense, I did choose to remove the foreground elements available at the time. So how do you actually capture the lightning bolt on the sensor of your camera? I used a relatively low ISO, a shutter speed around 10 seconds and aperture was around f/5.6. There was a reason for each one. Shutter Speed-10" may be a little lengthy for some point and shoots. Max is usually 8" from the ones I used in the past. Ten second exposures were long enough for my needs, but they recorded and wrote to my card fast enough that I didn't experience any serious lag time between photos. Lag time is bad because its not possible to start a new photo while it is writing the last one. Audible lightning that night was spaced about 30 seconds apart, and the ones visible from my balcony were spaced about one minute apart. ISO - I set ISO last. I knew the settings I wanted to have from aperture and speed values. ISO was shifted on my camera until my given settings gave me an exposure value equal to negative two/thirds. This kept the lightning bright (with semi-wide aperture) and at the same time, controlled the continuous ambient light - being the would-be nuclear tungsten lights in the neighborhood. Culprits of the dreaded light-pollution. The third one has a little bit of the tree but not enough to give the viewer any real idea to the size of the lightning. There were "2 mississippis" between seeing the flash and hearing the thunder though. What else is important? Tripod! definitely not possible without it. I mention it last because I like to think its the first thing everyone would assume when you have ten second shutter speeds. So yeah, tripod. I also used a wired remote trigger. Locked it down in place so it takes photos continuously until I release it. This keeps vibrations and blur to a minimum. Also - be safe. I had the priviledge of using my sheltered balcony. Standing outside in thunder electrical storms with sturdy metal tripods is not recommended.